A lifelong advocate for international human rights, Greenberg headed the NAACP Legal Defense and Educational Fund (LDF) for 23 years. He was hired as a staff attorney fresh out of Columbia Law School at age 24 and eventually succeeded Thurgood Marshall as director-counsel from 1961–84. Greenberg represented Martin Luther King Jr., but was best known for his role in litigating Brown v. Board of Education, the landmark 1954 civil rights case in which the high court rejected “separate but equal” public schools for blacks and whites. He also handled hundreds of cases in the lower courts on issues including school desegregation, equal employment, fair housing and voter registration. Greenberg had been the sole surviving member of the team of attorneys who litigated Brown. Greenberg was a beloved professor and mentor who served dean of Columbia College (1989-1993) and was a member of the Columbia Law School faculty for more than 50 years. As dean, Greenberg was instrumental in the creation of an exchange program with Howard University, which continues to this day, as well as in raising funds for internship opportunities for College students and the renovation of Ferris Booth Hall, the student center at that time. As the Alphonse Fletcher, Jr. 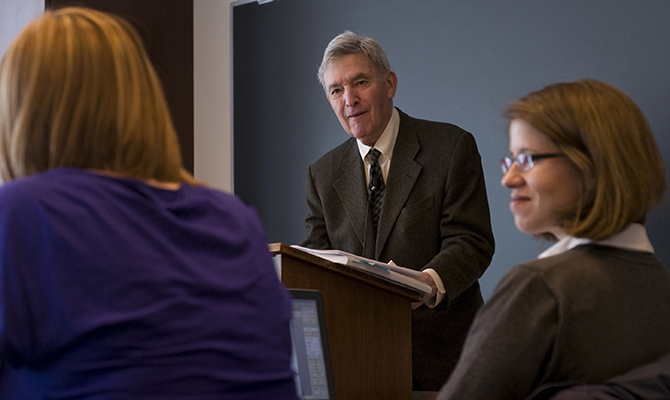 Professor of Law, Greenberg turned his passion for social justice into a long and illustrious career as a teacher and mentor. He created the Human Rights Internship Program at the Law School, which has placed more than 1,500 students at organizations around the world. Graduates of the program have gone on to help draft the South African Constitution, document human rights abuses committed against gay and lesbian youth in U.S. prisons, and establish the International Criminal Tribunals for Rwanda and the former Yugoslavia, among other initiatives. Born to immigrant Jewish parents on December 22, 1924, Greenberg grew up in the Bensonhurst section of Brooklyn and in the Bronx. His parents taught him to value education and instilled in him a profound sense of justice and fairness, he recalled in his 1994 memoir, Crusaders in the Courts: How a Dedicated Band of Lawyers Fought for the Civil Rights Revolution. Greenberg’s mother was committed to sending her son to Columbia and saved 50 cents every week in a Metropolitan Life Insurance account toward that goal. When Greenberg enrolled at Columbia College, he intended to become an accountant like his father. But his time in Morningside Heights proved to be transformative. Greenberg immersed himself in philosophy, literature and the concepts and values of the Enlightenment. This education laid the foundation for his future human rights work, he would recall later. Greenberg pictured at Iwo Jima a few days after the U.S. invasion. Greenberg entered the Navy in 1941 while still a full-time student working toward his undergraduate degree. In 1945, he served as a deck officer aboard a tank landing ship in the Pacific Ocean theater and fought in the battles of Iwo Jima and Okinawa, as well as the attack on Iheya Jima, one of the final invasions of World War II. Greenberg was disturbed by the brazen racial prejudice he witnessed during his Navy service, and at one point he confronted a superior about an African-American sailor unfairly confined to the brig for a minor infraction. The captain threatened Greenberg with a court-martial during the ensuing shouting match, but eventually relented and released the sailor. After the war, Greenberg enrolled at Columbia Law School in the fall of 1946. During his second semester, he spotted an announcement describing a seminar called “Legal Survey,” taught by Professor Walter Gellhorn LAW’31. The course allowed students to work for civil rights organizations, gathering facts and writing memoranda, complaints and briefs. (Its title was deliberately vague in an era of frenzied anticommunism that saw many such organizations widely demonized.) Greenberg sprinted up two flights of stairs to register for the class in Gellhorn’s office. During his four semesters in the course, Greenberg worked at the ACLU, the American Jewish Congress and LDF — in addition to spending time at other nonprofit organizations — and quickly began to display a talent for civil rights work. He graduated from Columbia Law School in October 1948, benefitting from a two-year accelerated program offered after the war to accommodate the massive influx of veteran students. Soon after, Gellhorn recommended the young attorney to Thurgood Marshall for a position with the LDF, which Marshall headed at the time. In 1952, just 11 days before his 28th birthday, Greenberg argued before the U.S. Supreme Court in the Delaware lawsuit Gebhart v. Belton, one of five cases consolidated under Brown v. Board of Education. Gebhart included two separate lawsuits involving African-American students compelled by segregation to study in schools inferior to those of white students. The Court handed down its Brown decision in 1954, ruling that state laws establishing segregated public schools were unconstitutional — a decision Greenberg called the most important court ruling of the 20th century. He said he never doubted the case’s outcome. “I’m a pretty optimistic sort of guy,” he told The New York Times in 2004. Greenberg also litigated the 1961 case that resulted in James Meredith’s integration of the University of Mississippi, and Furman v. Georgia (1972), in which the high court put in place a de facto moratorium on capital punishment in the U.S. But his dedication to civil rights and equality extended far beyond the courtroom. According to the NAACP, in 1951, while traveling with two black colleagues in Atlanta, Greenberg told a cab driver he was black after the driver refused to transport passengers of different races. He also slept in segregated hotels and ate in segregated restaurants to maintain solidarity with his black co-workers, fellow advocates, and clients. In 1961, Marshall chose Greenberg as his successor at LDF, and, four years later, Greenberg represented Martin Luther King Jr. in a Montgomery, Alabama, courtroom, securing King’s right to march from Selma to Montgomery in support of voter registration for African-Americans. King relied on Greenberg’s legal expertise, according to the NAACP, calling on the attorney to handle all demonstration cases involving the Southern Christian Leadership Coalition. Aside from his work at LDF, Greenberg helped to launch an array of other human rights initiatives. He was a co-founder of the Mexican American Legal Defense and Educational Fund in 1968; founded the Earl Warren Legal Training Program, which aims to boost the number of African-American attorneys in the United States; and was a founding board member of Human Rights Watch. He also participated in rights missions to the Soviet Union, Poland, and apartheid-era South Africa, among other places. In 1984, Greenberg resigned from LDF to take a position as a full-time professor and vice dean at Columbia Law School, where he had served as an adjunct professor since 1970. That same year, Columbia University gave him the honorary Doctor of Laws degree for his efforts toward “furthering social equality.” In addition to his creation of the Human Rights Internship Program, he taught courses in constitutional law, civil rights and human rights law, as well as a class on civil procedure and a seminar called Kafka and the Law. Greenberg, who was named dean of Columbia College in 1989 and served in that post until 1993, held several visiting professorships throughout the United States and the world. Toward the end of his life, Greenberg championed equal rights and integration for the Roma in Europe. He saw parallels between the civil rights struggle for African-Americans in the United States and the plight of the Roma, which he considered one of the world’s most serious humanitarian and economic crises. Greenberg received numerous awards for his human rights work, including the Law School’s Medal for Excellence in 1999 and the Lawrence A. Wien Prize for Social Responsibility in 2009. In 2001, he was awarded the Presidential Citizens Medal from the White House. “In the courtroom and the classroom, Jack Greenberg has been a crusader for freedom and equality for more than half a century, [and] he has helped shape a more just society,” President Bill Clinton said in awarding the presidential honor. Beyond his human rights work, Greenberg was a man of eclectic interests. An oenophile and amateur chef, he penned the 1991 cookbook Dean Cuisine or the Liberated Man’s Guide to Fine Cooking together with the late James Vorenberg, the former dean of Harvard Law School. (Julia Child lauded the authors — who included recipes for guacamole, beef stroganoff and lamb in an almond cream — in a review of the book for The Harvard Law Review.) Greenberg also studied Mandarin Chinese, enjoyed classical music and was an admirer of the influential French Renaissance writer Michel de Montaigne. In January of 2014, Greenberg’s fellow faculty members held a gathering to pay tribute to their esteemed colleague as the 50th anniversary of the 1964 Civil Rights Act and the 60th anniversary of the Brown decision drew near. He was feted again for his 90th birthday in December 2014. “May Columbia Law School be filled forever with students and professors devoted like him to protecting human rights and liberty,” he said. Just one week ago today, the Columbia Law School community honored Greenberg at a ceremony to unveil a new portrait of him, and to celebrate his remarkable career and immeasurable contributions. He is survived by his wife, Deborah M. Greenberg LAW’57; his three children from an earlier marriage, David, Sara and Ezra Greenberg; his stepchildren, Suzanne Greenberg and William Cole; and five grandchildren. For more on Greenberg's life and career, please visit the Law School’s tribute page. A version of this story first appear on the Columbia Law School’s website.